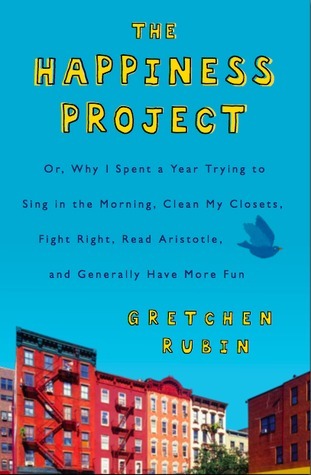 I recently reread The Happiness Project by Gretchen Rubin. Winter, and February in particular, is a hard time of year for me, so I wanted to remind myself of little things I can do to improve how happy I am in my every day life. Rubin conceives of a “happiness project”: paying attention to all the elements of her life and experimenting to find ways to increase her daily level of happiness in small ways. While Rubin admires writers like Thoreau and Elizabeth Gilbert, who change their entire lives to explore a happiness project, Rubin wants to see if it’s possible to improve her happiness without leaving home. She spends a year exhaustively researching happiness – what famous people have written about it, what conventional wisdom says will make us happy, what studies show is important, and more – and works to distill “happiness” down to what it means for her specifically to be happy. Every month she focuses on a different aspect of happiness (energy, marriage, work, parenthood, fun, spirituality, etc.) and identifies key areas to focus on, things she can improve right now in her own life. Rubin is what could be described as a Type A personality: having decided to tackle happiness, she examines the subject from all angles, researches it exhaustively, and comes up with charts, journals, and other benchmarks to track her progress accurately, and she starts a blog, where she both inspires others and receives inspiration from around the world. Those who don’t enjoy the book find Rubin to be obsessive and annoying, but personally, I think she’s charming, and I found her journey to be fascinating, fun, and endearing. With all her little foibles, Rubin seems very real. The book is well written, and Rubin choose the right details, stories, and quotations to make her points clearly and make the text resonate for the reader. Over the course of the book, Rubin tries out a lot of methods, techniques, tips, tactics, and theories, and by the end, she’s discovered the ones that work well for her and her family. The operative phrase here is “for her” – Rubin openly acknowledges that many of her resolutions won’t work for someone else. She urges readers to embark on their own happiness project and find out what will work for them. This is really the best takeaway from The Happiness Project: in writing the story of her own experimental year, Rubin has become a happiness coach, full of inspirational examples and information that readers can apply in their own lives. Rubin also quotes liberally from reader comments on her blog; these comments are often as interesting and thought-provoking as Rubin’s own prose, and provide even more examples and food for thought. Overall, The Happiness Project succeeds as a memoir, a research book, and a self-help guide for anyone wanting to be happier. 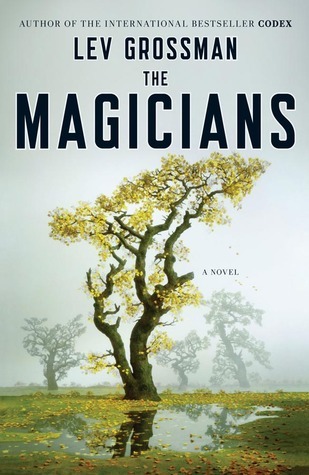 Last week I read a book called The Magicians, by Lev Grossman. We meet the main character, Quentin Coldwater, during his senior year in high school. He’s a brilliantly gifted but awkward kid, dreaming of his best friend’s girl and trying to get into Princeton because that’s what seems to be expected of him. Instead, he receives an invitation to attend a secret college for magicians. Quentin had practiced card tricks and sleight of hand, but apparently he has a gift for the real kind of magic also. Quentin is no Harry Potter. Frequently depressed, Quentin’s life is characterized by disappointment that all the things that were supposed to make him happy never do. This makes some sense when he’s younger – what smart awkward kid is ever happy in high school? – but his disillusionment returns again and again. A magical school is what he’d hoped for his whole life, but after the wonder wears off and the hard work sets in, Quentin isn’t happy there. And later on, with graduation looming and afterward, Quentin still isn’t happy, despite the fact that with his powers he could do, literally, anything he wants. Although our problems are less magical, most of us are a lot like Quentin. We work hard and then expect happiness to come to us, always looking ahead to something else that, like magic, will make us happy. We expect happiness to be a country we can inhabit where, if we can just get there, we’ll never be sad again. But happiness has to come from within. It’s an attitude, a state of mind. If we can let go of our expectations about what it means to be happy and open ourselves to the possibility of being happy right here, right now, then we can experience what happiness truly can be. My father has had three spine surgeries to date, and as a yoga teacher, I’ve wondered what I could do to help him while at the same time fearing to damage his back further. My friend Kyle recommended this book. Dr. Brownstein’s program is one that a yoga teacher can really get behind, focusing not just on recovering from physical injury, but on the mental, emotional, and spiritual aspects of healthy living as well. Dr. Brownstein begins the book by telling the story of his own struggles with debilitating back pain and his journey to recovery. His experiences give him a special understanding of what those with back pain are suffering. Because of his own search for healing, Dr. Brownstein has a unique perspective on how to heal from a back injury and prevent future problems. Dr. Brownstein’s program for healing is based on his concept of the mind/body connection, described in chapters 2 and 3. According to Dr. Brownstein, mental and emotional stress can result in an increase in muscle tension and tightness, leading to injury. Dr. Brownstein urges the reader not to overmedicate, or to leap ahead to treating back problems with surgery and other invasive techniques; rather, he advocates spending some time with the pain, to understand what’s wrong and what the body is trying to communicate. It’s important to understand how the back works physically, and chapter 2 describes back anatomy in detail so the reader will understand the structures and terminology and know how back pain can result from weakness, imbalance, or strain elsewhere in the body. But sometimes the best and most permanent solution to a back problem is to make changes to lifestyle and behaviors that cause stress. 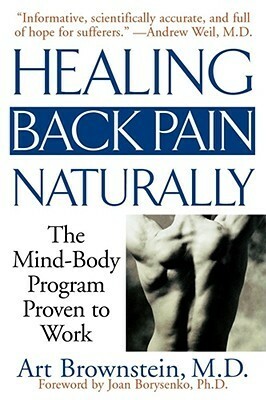 This book covers the full lifestyle spectrum in Dr. Brownstein’s approach to healing the back. Chapters 4 and 5 discuss the physical body. Chapter 4 includes a wide variety of stretches for the back; most of these are taken from yoga asanas, and may are simple and gentle enough to be done in the midst of back pain and can lead to some relief when done properly. Dr. Brownstein outlines how to use these stretches, in the order he lists them and over time, to regain mobility and reduce pain. Once the back has been fully stretched and the pain is gone, the reader can move on to strengthening the back as described in chapter 5. Back muscles that are both flexible AND strong are less likely to be pulled or strained. Chapters 6-10 cover stress management, healthy eating, work, play, and spirituality as they relate to back care and overall health. Dr. Brownstein takes a holistic approach based on his mind/body concept: since anxiety and stress can affect the body, causing muscle tension and contributing to injury, it’s important to heal not only the body but also the mind, heart, and spirit to truly recover from a back problem. By reducing stress, reducing caffeine intake, improving one’s outlook on work, opening the heart in personal relationships, and cultivating a sense of humor and fun, the reader can improve her overall health and happiness and remove many of the stressors that can lead to future back pain and injury. I’ve never suffered from a chronic pain condition, so I can’t comment on the book’s usefulness for those actively in pain. However, as a yoga teacher, this book helped me to understand better the perspective of someone in that kind of pain and gave me some tools to help those future students. I plan to buy a copy of this book for my dad as well. Wait a minute, you may be thinking. You come to this blog for yoga, and here is a book with a picture of a dragon on the cover. Now, many of you may not know this, dear readers, but I have loved fantasy novels for far longer than I’ve loved yoga. Being so far along in my pregnancy, I haven’t felt up for reading much nonfiction or anything that feels like a “serious” book – I wanted fun, light reading. It seemed like a good time to revisit some of my favorite fantasy novels. And when something in a fantasy novel jives with my yoga, I can’t help getting all bubbly about it. 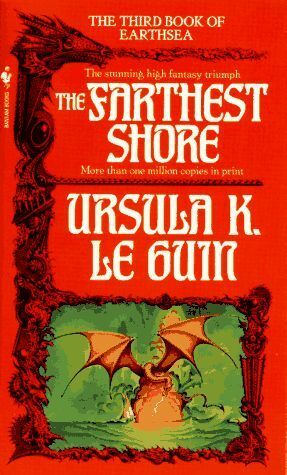 The Farthest Shore is the third novel in Le Guin’s Earthsea cycle. It was first published in 1972, and it’s about (roughly) a wizard and a young man taking a journey to figure out what’s going wrong with magic, what darkness is coming across people’s hearts. There are sorcerers and dragons and at least one sword fight, but the thing about Ursula Le Guin is that she doesn’t just write about sorcerers and dragons (or about rocket ships and aliens in her science fiction novels) – she uses these concepts to look at what’s going on in the world, what it means to be a human being. The Earthsea books in particular are ostensibly about wizards and magic but really deal with deeper ideas about life and death that are very powerful. I’ve read The Farthest Shore before and so I knew it had these life/death themes, but on this read I found even more to love. What struck me most is that our hero, the wizard Ged, is totally a karma yogi! On several occasions, he talks to his companion Arren about what it means to be a man of action, and how the best path is to take no action at all. In particular, their conversation after Ged rescues Arren from slave traders is interesting: Ged talks about maintaining balance, acting with responsibility. He says, “It is much easier for men to act than to refrain from acting…. do nothing because it is righteous or praiseworthy or noble to do so; do nothing because it seems good to do so; do only that which you must do and which you cannot do in any other way” (67). This could have come right out of the Bhagavad Gita! I wonder if that’s what LeGuin was reading in the early 1970s? And Ged backs up his statements about action in the way he lives. He goes on this journey only because he must; none of the other wizards will acknowledge the problem or understand what’s needed to solve it. His action is needful to preserve balance in the world. In this and in other books in the series, he only uses magic when it’s necessary, and magic is shown over and over again to have serious consequences when its use is out of balance. I loved finding Ged to be even wiser than I’d remembered him, and I loved finding karma and dragons in the same book. I found Cope’s approach to this book pretty fascinating. He began writing the book with the intention of writing a traditional commentary on Patanjali’s Yoga Sutras, and he completed exhaustive research into yoga philosophy and Sanskrit with this in mind; however, the focus of the project morphed and shifted as he wrote. The final book includes three intertwining components: commentary and explanation of the yoga sutras, explication of the sutras from a modern psychological perspective based on Cope’s experience as a psychotherapist, and a semi-fictionalized/loosely memoirish account of the yoga explorations of Cope and five of his friends during the years Cope was working on the book. The book benefits immensely from Cope’s philosophical and spiritual research without becoming too esoteric for the beginner. Cope discusses key concepts from Patanjali, such as the steps of the eightfold path, in an accessible way; he also relates some of Patanjali’s teachings on meditation and the mind to similar teachings in Buddhism, which I was really intrigued by and hadn’t seen elsewhere. Cope’s perspective as a psychotherapist helps to elucidate for the modern reader why this yoga stuff actually works and what it does to our minds. I personally found the psychological verbiage to be a little heavy and technical for my taste, so I didn’t spend a lot of time dissecting and digesting it, but I still found those passages to be interesting and informative even at a casual reading pace and level. What really kept me moving through the text were the stories of Cope and his friends. Cope would describe one person’s particular struggle – overeating, a lying habit, a lifelong conflict with a family member – then use that almost as a case study to discuss what, yogically and psychologically, was going on for that person, and show how yoga and meditation could help. Cope includes conversations among the friends as well, as they help one another work through their various issues. Each character makes progress on a spiritual path throughout the book, each in his or her own way, including the character of Cope himself as he struggles with the book he’s writing. Wanting to know what happened next for the characters kept me moving through the spiritual and philosophical material, some of which was very familiar to me, and the more technical psychological stuff, so I found the framework to be a useful and interesting way of organizing the book. 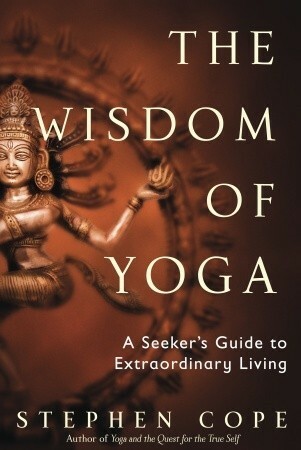 Overall I really enjoyed the book’s unique approach and would recommend it, particularly to those who want to explore the ancient philosophy of yoga and the mind from a modern perspective. I read Soloing: Realizing Your Life’s Ambition with the hope that it would help me plan out how to transition from an unsatisfying full-time job to a freelance career. After all, most yoga teachers are freelancers, or “soloists” in Rubin’s terms. 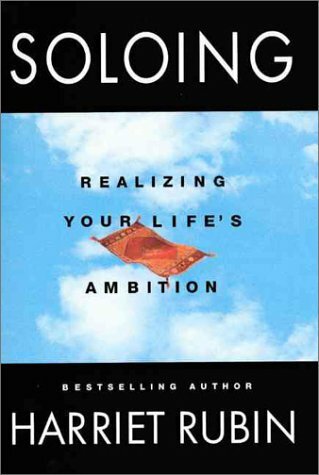 While Rubin has some good advice about following your passion, it ultimately wasn’t useful in answering the questions I had, and because the book was published in 1999, some of the information came across as a bit dated. Rubin spends much of the book discussing how to reinvent yourself and your identity outside of the corporate model, how to discover the work that truly inspires you, and how to generate the courage to pursue that work. While there’s some great content here, it’s not as useful to someone like me – I know my passions (writing, editing, teaching yoga and teaching writing), I just need to figure out how, financially, to build those passions into a viable career. In this area Rubin is lacking. The cover blurb notes that Rubin, a high-powered publishing executive for many years, now works with “leading CEOs” in her solo career, and this comes through in the content. Although Rubin strives to interview a wide variety of professionals in researching this book (including a master bonsai gardener and a corporate guy turned race car driver), her target audience is the dissatisfied exec looking to build a consulting career (and with a lot more cash in the bank than I have). For example, Rubin states that, when leaving your corporate job, you should be able to negotiate a retainer, exit package, or continued Cobra health insurance, which just sounds laughable to any average cubicle jockey. In general, employees in the lower echelons of the corporate world just don’t have that kind of bargaining power, and Rubin doesn’t seem to know it. Rubin states repeatedly that a soloist can make far more on her own than her previous corporate salary, and with only a few clients, but Rubin never addresses the practical concerns of how to identify and market yourself to your client base and find those lucrative clients. As a yoga teacher, I guess “clients” in this case would mean starting my own yoga studio and identifying private clients, but that’s not as feasible for a brand-new teacher just starting out when there are plenty of more experienced yoga teachers around. Making ends meet as a yoga teacher just doesn’t seem possible at first, letting alone turning a profit, and how do you get through the months or years of financial struggle to get to the point where the ends meet? I did appreciate some of the practical information Rubin provides – how to calculate expected business expenses and the income needed to pay the bills, what legal advice and insurance you should invest in. I also liked Rubin’s discussion of proposals, which will be directly useful to me as a writer/editor and possibly also as a yoga teacher (proposals could be useful if I do want to start my own studio, if I want to propose a special workshop or class, if I want to sell myself to a corporate client that wants to offer yoga to its employees, as a few examples). But overall I wanted more on the practical side of things. Rubin spends a long chapter discussing how to set up and structure a website and what sort of content to post there, and here’s where we see how far technology has come in the past 10+ years. No longer must you pay a web design firm to create a site for you (again, an expense the little folks can’t really afford) now that there are plenty of websites that help you easily design a professional-looking personal site and blog for free. It’s also cheap and easy to buy, register, and use your own personalized domain name. Rubin details the conversations she had with her web designer about how her site should be structured, and while it’s interesting, most of this just isn’t applicable anymore. Overall, Rubin gives some great advice to the soloist, and the book is still valuable and worth reading. However, it didn’t have everything I was hoping for, and I never really felt like I was the target audience. As a book on meditation, Mathieu Ricard’s Happiness: A Guide to Developing Life’s Most Important Skill is the best of both worlds, presenting both a spiritual and a scientific perspective. Ricard left a promising career in biology and genetics to become a Buddhist monk, so he uniquely understands both perspectives and is fascinated by the scientific study of the brain and how meditation affects, on a biological level, the way we think. Happiness is at once a guide to how meditation can improve our lives and help us to become happier and a thorough description of why it works, written in language accessible to any reader. 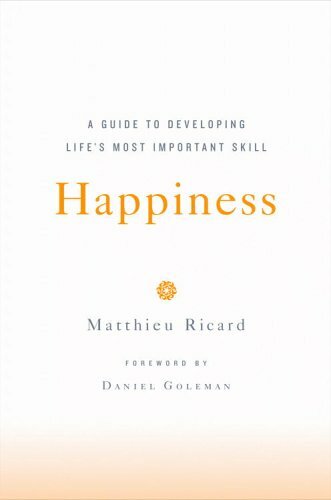 In the first few chapters, Ricard opens the book with discussion of happiness in general: is happiness the purpose of life? What does it mean to be happy, and how do we recognize happiness when we have it? Can we actively cultivate happiness in our lives? Concluding that happiness is possible and that cultivating it is worthwhile, Ricard then considers the problem of suffering. How can we be happy when we suffer; further, how can compassionate beings be truly happy when faced with the suffering of others? Ricard tackles this question, presenting stories of those who have suffered true hardship and examining the root causes of suffering. While we cannot control the events that happen to us, we can always control our responses to those events, and here is the real key to being happy under any circumstance. Over several chapters, Ricard discusses how we can use meditation in order to overcome ego, negative thoughts, and disturbing emotions, the obstacles within ourselves that prevent us from being happy no matter what occurs. Ricard speaks from his own and his teachers’ experience that when we can lessen the influence of the ego and negative thoughts and emotions, we feel more freedom and happiness in our lives. He then goes on to discuss happiness from the perspective of sociology, psychology, and psychiatry, citing laboratory studies of experienced meditators whose brains have been shown to function differently than ordinary people’s brains. Meditation over long periods literally changes brain chemistry, leading to great benefits in quality of life. Ricard as both a scientist and a talented writer, in these chapters and throughout the book, is able to describe a variety of scientific studies and their results in terms a layman can understand and appreciate. In the later chapters, Ricard examines positive attributes like altruism, humility, and optimism, and describes how cultivating these attitudes can help us to be happier. He cites evidence that those who are kind, humble, and optimistic tend to be happier than those who are not. By modifying our behavior to act more altruistically in daily life, or by being aware of pessimistic thought patterns as they arise, we can begin to make progress toward increasing happiness. In the book’s final chapters, Ricard addresses several difficult issues: appreciating versus wasting time, ethics and the dichotomy of good and evil, and how to be happy in the presence of death. Ricard’s wisdom truly shines in these chapters; his advice is inspirational, practical and uplifting. The concluding chapter rounds out the book by describing the challenges and great rewards of following a spiritual path. Ricard promises that with regular practice and dedication, we can each not only live happier lives but become kinder, wiser, and more compassionate. Developing these qualities can lead us, as it led Ricard, to a life of great meaning, freedom, and joy.